Apple (AAPL) is set to launch a new streaming TV service, according to an Oct. 23 report from The Information. This on-demand network will launch in 100 countries in the first half of next year, and it will give users the ability to buy shows directly from content providers. On paper, this is a big win for Apple. Cupertino has been trying to crack TV for a long time. Its Apple TV hobby has traditionally relied heavily on hardware. Lately, there has been a bigger push to produce original content. Variety reported Apple will spend $4.2 billion on original programming by 2022, with $1 billion earmarked for 2018. It is a large number, and it hints at the resources that big technology companies are pouring into building out their media networks. 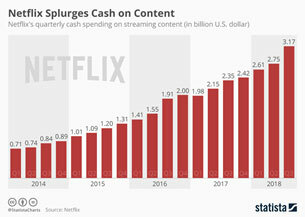 Netflix (NFLX) will spend $8 billion this year making new programs for its 137 million subscribers. Amazon.com (AMZN) will fork out $4.5 billion. At last count, the online retailer had 100 million Prime subscribers. Netflix is spending $8 billion this year on original programming. Apple is spending $1 billion to do the same in its TV streaming service’s debut year. YouTube, the video streaming service owned by Alphabet (GOOGL), is the most popular streaming site in the world. In February 2017, viewers watched 1 billion hours of YouTube content every day. Much of that is concentrated in the highly coveted 18- to 34-year-old demographic. Last year, the company began toying with YouTube TV. It was a direct attack on cable TV. The idea was to bring users the same glitch-free streaming that YouTube has mastered. • Six individual accounts, so family members can build TV experiences geared to their interests. Members can even save favorites to a free personal DVR cloud. Google Assistant, the company’s voice-activated, personal digital valet is being rolled out. Imagine never again scrolling through antiquated TV guide menus or digging all your remotes out of the sofa cushions. Major technology companies are targeting cable TV because they have a distinct advantage, and the industry is especially vulnerable. Netflix, Amazon, Apple and Google have sunk millions into building better technology. Consequently, they have millions of happy customers milling around in their ecosystems. These users understand the product. They like the customer service. So, selling them a TV subscription is a no-brainer. And streaming technology has finally reached the stage at which it is reliable. By contrast, customers rank their cable TV service enjoyment somewhere just below major dental work. An August 2018 survey from Consumer Reports found even the biggest companies have woefully low ratings from customers. Only 38% were highly satisfied with their service. The culprit is cost. The industry is riddled with bait-and-switch plans that start low and steadily ratchet higher in price with hidden fees. The experience is complicated by poor customer service. Apple plans to offer a service similar to Amazon’s Channels. The idea is that users can select the channels they want and pay a monthly fee. The company will bundle content from the likes of HBO, Showtime, AMC, CBS and others, plus throw in its shows as they come on stream. It will be completely transparent, and backed by Apple customer service. Long-term investors can buy all the major technology companies to take advantage of this development. This is a big market. 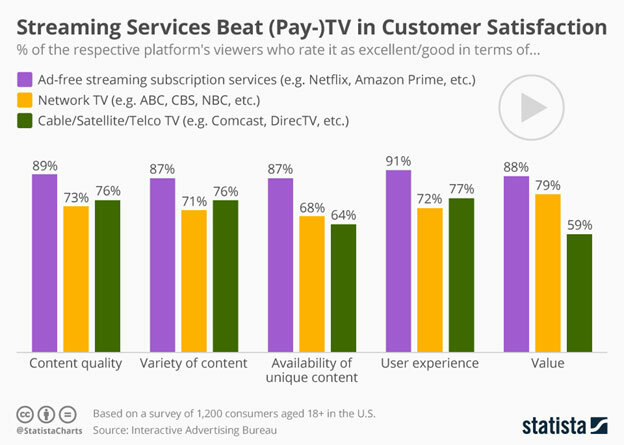 There will be many winners as customers are slowly weaned away from traditional cable providers. 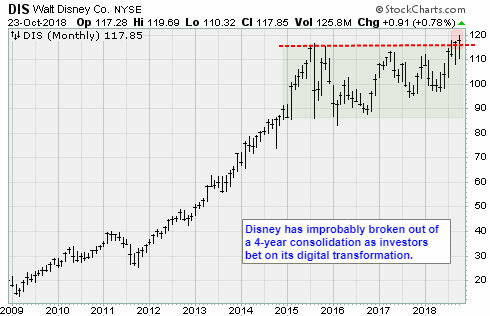 However, the best way to play this trend might be Disney (DIS). In addition to theme parks and movie studios — Walt Disney, Pixar, Marvel and Lucasfilm — Disney is home to a growing network media empire. In December 2017, Disney announced a $53 billion agreement to merge with 21st Century Fox. The deal gives the company control of the country’s third-largest movie studio, the Fox TV network (minus cable news), and cable networks FX and National Geographic. The new House of Mouse will be the biggest media network ever assembled. 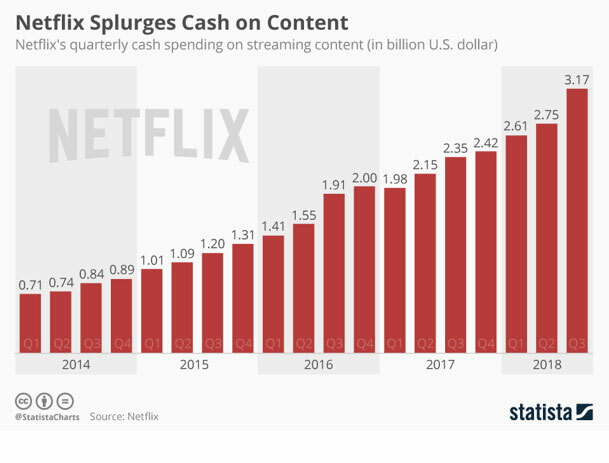 Most that content goodness is going to be packaged as digital streaming channels, and sold as a monthly subscription like Netflix. In August, Bob Iger, chief executive officer, promised the new service would be price competitive, and build momentum slowly. Disney has a long-standing relationship with Apple. It is probably more than a coincidence that both companies are promising to enter streaming at the same time. The stock trades at 16 times forward earnings, and shares have been firm despite the recent market weakness. The market capitalization is $175 billion. 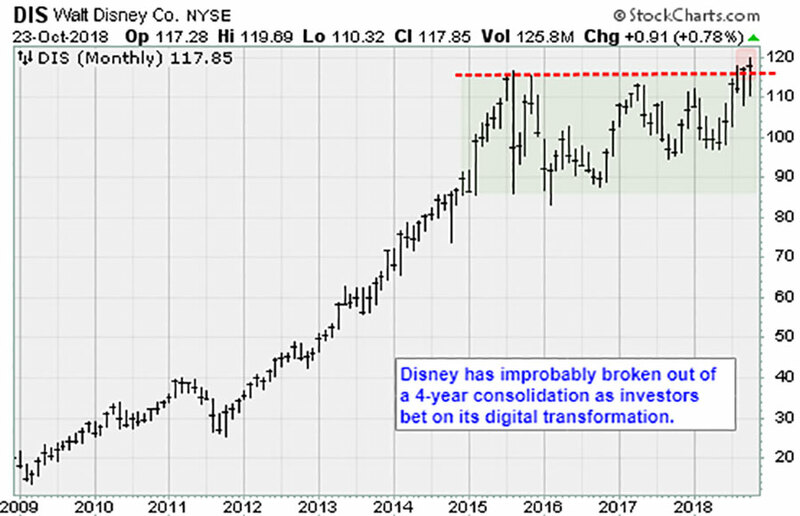 Buy Disney into weakness when you get a chance. In the next few years, it will be seen as the ultimate cable TV killer. Very interesting update. A few months ago you had indicated you were going to concentrate your recommendations on Lowe priced stocks. How about a few more o a commentary on why we rarely see stock splits on the $300 and up price point?